Medical professionals are required to complete a certain number of Continuing Education (CE) hours. For example, pharmacists in the state of Pennsylvania must complete 30 contact hours of Accreditation Council for Pharmacy Education (ACPE)-approved pharmacist continuing education every 2 years. 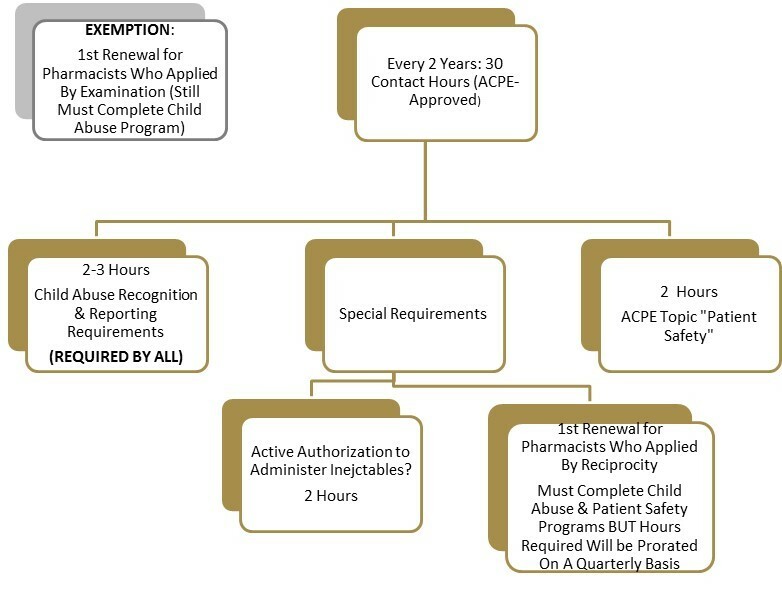 See the diagram below for more details on the PA requirements for pharmacist license renewals. The RealCME App allows health professionals to complete continuing education requirements on-the-go on their mobile devices. RealCME has been accredited by the Accreditation Council for Pharmacy Education (ACPE) as well as the AMA, AAFP, AANP, AAPA, ANCC, AOA, APA, COPE, and other organizations. This app offers free CE lessons certified by the Johns Hopkins School of Medicine, and is available for free on iTunes and Google Play. The app offers featured topics and segmentation by topic. The chart below includes the topics from which health professionals may choose. Users may choose a desired activity, subject matter, and number of credits upon opening the app. The app will take the health professional through a learning module that has responsive quiz questions interspersed to track the progress of learning. Once successfully completed, the user can enter professional credentials to submit and receive CE credit. A certificate of attendance is also received once a session is successfully completed and states the number of CE credits earned. Other useful tools offered within the mobile app include a “Planner” that allows you to schedule activities that can later be found under the “Planned Activities” as well as a “Tracker” to list all credits and requirements/goals completed. A “Performance” tab allows the user to see information in chart-format such as your scores when compared to the community average in terms of subject areas, your progress towards goals that you have set through the “Tracker”, and program scores for each completed CE course. The RealCME App provides a convenient medium for earning CE credits on-the-go for healthcare professionals as it is built for mobile and other portable devices. It is a good option for those who do not get much time to sit down at a computer or in a lecture; however, its limitations lie in the number of available programs which range from 1 to 10. PHSI re-reviewed the Micromedex App after learning that Micromedex has recently updated their mobile drug information collection to include the Micromedex Drug Reference App and the Micromedex Drug Reference Essentials App. 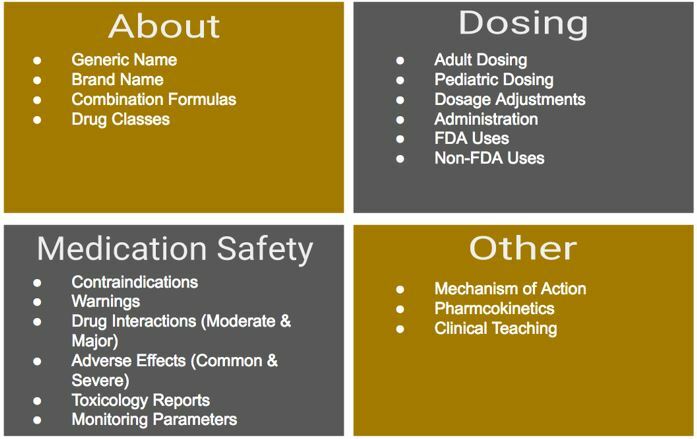 These two new additions replaced the previous Drug Information App in March 2017. Users with internet-based subscriptions through an employer or school will be able to log in to that subscription through the Drug Reference App. Pharmacists and other healthcare professionals are still able to access evidence-based drug information without a subscription with the Essentials App. Both apps provide information on over 4,500 drug products. The chart below contains details on what is offered. Micromedex reports being the world’s most complete and carefully researched clinical decision support system, utilizing a team of more than 90 specialized clinicians who perform in-depth reviews of published medical literature. Micromedex is a product of Truven Health Analytics, Inc., whose goal is to deliver unbiased information, analytic tools, benchmarks, and services to the healthcare industry. The information is easy to navigate, and products can be searched by name or therapeutic class. There is also a “What’s New” section which identifies recently added and removed drug products and drug information documents. Limitations include the apps do not enable the user to view common searches or save specific products as favorites. Subscription users are able to log into the app for free with a password. Non-subscription users are able to purchase the Essentials app for $2.99/year. The apps are compatible with iPhone, iPod touch, iPad, and Android. iOS 3.0 or later is necessary for Apple products, and Android 2.2 or later is necessary for Android products. Updated versions of the apps are continuously released. To ensure that users utilize the most current information, the apps cannot be opened unless all updates have been downloaded. In addition to drug information, Micromedex offers apps specifically covering drug interactions, IV compatibility, pediatrics, and neonates for a fee. For more information, visit http://truvenhealth.com/products/micromedex/quick-reference/mobile. PulsePoint Respond app allows citizens trained in cardiopulmonary resuscitation (CPR) to locate and assist nearby victims of a cardiac emergency. It alerts CPR-trained users when someone nearby requires CPR, providing the locations of the victim and closest public access Automated External Defibrillator (AED). PulsePoint Respond currently covers hundreds of cities by partnering with local fire departments or emergency response agencies. PulsePoint Respond is intended for anyone willing to report a person in need of CPR, and people who are CPR-trained. PulsePoint Respond is maintained through the PulsePoint Foundation, and is free to anyone who wishes to download it. The PulsePoint Foundation also offers PulsePoint AED, which is a comprehensive registry of AEDs available for emergency use. By downloading the PulsePoint AED app, users can report AED locations to help local responders and citizens utilizing the PulsePoint Respond app. Upon download, the app allows a user to follow local emergency response agencies. Following the agencies will provide a newsfeed on current emergency events and what responses have been already taken. There is also educational information on CPR, AED use, and unit identifiers for dispatch statuses available on the app. A limitation associated with this app is the delayed uptake by local agencies. There has been some delay in establishing coverage, and the PulsePoint Foundation is placing responsibility upon users to approach local authorities for initiation into new areas. Local agencies may be wary of non-professionals intervening in emergency situations where they are not trained for when a professional is on the way to the scene. On the other hand, PulsePoint Respond is addressing a legitimate need, as heart disease is the leading cause of death in the United States. Most pharmacists are trained in CPR, and all pharmacists act in a manner to improve patient lives. That being said, this app provides an opportunity for pharmacists to further extend their knowledge and training for the betterment of the surrounding community. PulsePoint Respond and PulsePoint AED are currently available for both iOS and Android systems. The Glucose Buddy App is a data storage utility developed by Azumio Inc. for diabetic patients. This app is available for free on any iPhone, iPad, or iPod touch product with iOS 4.0 or later, as well as all Android devices. This mobile app easily keeps track of the blood glucose readings that are manually recorded from the user’s glucose monitor. It even allows users the option to enter productive notes such as “blood sugar elevated because of high carb lunch” so that their personal health record is more complete. This diabetic app also gives users the option to record the name and dose of their medications, along with the corresponding time they were taken each day. Once a drug/dosage combination is entered, it is saved so that users must only select the medication from their list of previously entered products. Additional free features provided by this app include daily food, activity, and HbA1c logs, as well as charts that compare weekly and monthly log recordings. Another helpful feature is the ability of the app to send out push notifications in order to provide users with reminders and alarms when it is time for blood glucose testing and/or medication administration. A more advanced “Pro” version of this app is available for purchase at $6.99, which includes additional log options for blood pressure and weight and eliminates in-app advertisements. Glucose Buddy is an easy-to-use journal app specially individualized with each patient’s diabetic history. Users have the ability to print out their log results to bring with them to their doctor’s office by syncing the logs to their account and then accessing them online. One drawback is that the app relies heavily on the patient to record this data accurately, so failure to do so will result in incomplete data sets. To get started, simply download the app and then go online to create your free account. For more information on this app, please visit www.glucosebuddy.com. The Children’s Hospital of Philadelphia has released an app called “Vaccines on the Go: What You Should Know” to help parents have quick access to reliable information about vaccinations and the diseases they prevent. Not only does it go into detail about the vaccines, vaccine side effects, diseases, contagiousness of the disease, and timeline of the disease, but it contains a section dedicated to talking about vaccination safety. The vaccination safety section addresses concerns about vaccines such as risk of autism, vaccine components like thimerosal, and egg allergies. The app has videos that discuss the information found within the app, which may be helpful for those parents who have a low health literacy. The app contains a vaccine schedule for children, teens and adults. For parents worried about the number of vaccines their child is receiving, there’s a section answering those questions. This app would be a great recommendation by the pharmacist or physician to parents who just had their first child, or had questions or concerns about vaccinations. If parents still had questions after using this app, there’s functionality to make a note to bring up to their doctor and the ability to email the Vaccine Education Center with questions. Vaccines on the Go is full of valuable information, but there are a few limitations of the app. While the app provides a vaccine schedule, it does not provide a place for parents to record the administration date of a vaccine, which might be more useful to parents later on in their child’s life, as many parents lose immunization cards or fail to keep those records accessible. This app is free for both Apple and Android devices. More information is available on the app’s website at http://www.chop.edu/service/parents-possessing-accessing-communicating-knowledge-about-vaccines/vaccine-mobile-app.html.